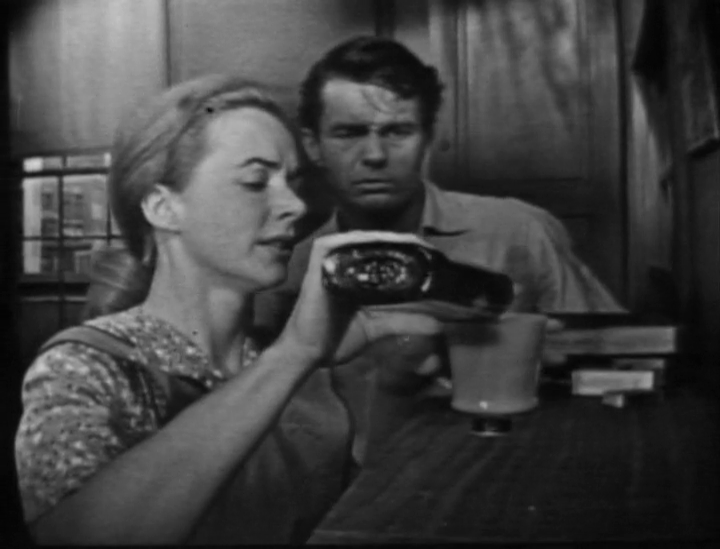 Having just screened some early television programs in my Electronic Media class, I never seem to get across the extraordinary nature of live anthology dramas, specifically the gravity of Days of Wine and Roses (1958). Every television historian has a soft spot in his/her heart for live anthology dramas. What’s not to like? These “teleplays” were well-written, well-acted, and focused on deep character psychology. They were also performed live and almost never repeated. The only reason we have these programs is because someone made a recording of the kinescope. A kinescope recording works like taking a film camera and recording a television screen, but because video runs at a rate of 30 frames-per-second and a film camera runs at 24 frames-per-second, the camera had to drop six television frames for each second. It was not easy, nor was it always pretty. In this installment of Playhouse 90 from 1958, Days of Wine and Roses concerns a married couple who are alcoholics. The portrayal of this disease is extraordinary. This clip starts after Joe, a public relations man, has reached his moment of clarity and begins attending Alcoholics Anonymous meetings. AA was a fairly new organization in the late 1950s, founded in 1935, and was gaining prominence by this point. During his testimonial, there’s a flashback to a particularly dark part of his and his wife’s lives. Joe’s and Kristen’s addiction is absolutely breathtaking. When I first saw this about five years ago, the representation of rye whiskey, a socially acceptable and even upscale spirit today, compares to how we think of crack cocaine or meth today. Beyond the addiction, the performance is relatively naturalistic: the stage-trained actors seem like real people, not delivering a stylized performance. It’s gritty but not exaggerated. Also, consider the medium of television. There are a lot of closeups and very few cuts (or “switches” in the parlance of live television). Televisions were much smaller than the sixty-inch sets of today, and the tight framing would foster some intimacy between the viewer and the character. If the title sounds familiar to you, it’s because it was remade as a film in 1962, starring Jack Lemmon and Lee Remick, and the Henri Mancini and Johnny Mercer co-wrote the title song. Days of Wine and Roses is available on The Golden Age of Television from the Criterion Collection.